Do more with less. Work better, faster, cheaper. Keep quality and service high. This is how law is practiced now. Whether you’re a General Counsel or a Partner at a law firm, these mantras are the governing paradigms. Successfully navigating the evolving legal economy can be a challenge and lawyers need to think differently. Start by collaborating more. It’s healthy and efficient for your law department, your firm and your career. Known for their competitive spirits – legal professionals often have misconceptions about collaboration. They improperly view it as weak, “only for engineers” or not something you do to get serious work done. Such beliefs are flawed and short-sighted. Collaboration isn’t a dirty word; it’s an ingredient for success! Legal professionals often believe that networking is just about the connection. Getting the business card (if anyone still uses those) or connecting on LinkedIn. But that’s only the first step. Collaboration is a heightened form of networking and relationship building. When you make that connection, think about how you can help that person. The conversation should start with “how can I help?” Every successful legal professional can trace their steps to each win and find that at some point along the way, it was a relationship or some information shared by a colleague that led to that success. If you think back to how you’ve interacted with your colleagues over the years, you’re also likely to find some close saves when a piece of information from someone in your network just saved you from moving forward with what could have turned out to be a bad hire, a subpar business partner or a wrong move. As cultural paradigms have evolved to encourage social sharing, our professional paradigms have also evolved. Whether you’re a sole practitioner, in-house counsel, a General Counsel or law firm Partner, sharing your ideas, expertise, and resources showcases what you know, builds goodwill and sets up a lot of good karma to flow back in your direction. That’s why I created Foxwordy, the collaboration platform for the legal industry. Over 20 years in the law, I consistently found collaboration to be essential to good lawyering. I have also been a long-time proponent of collaborative cultures in workplaces and have applied that same thinking to my own businesses for years. Since most lawyers have historically relied on random face-to-face interactions, phone calls or emails to collaborate, I recognized that there was a need for a solution that would make collaboration easy, efficient and tech-driven. There are many tangible benefits you can derive from collaboration, including saving time, increasing employee morale, building stronger relationships with colleagues and conserving budgets and resources. Foxwordy brings an easy-to-use, efficient and secure cloud-based collaboration solution to the entire legal market. Foxwordy allows lawyers to collaborate with colleagues within and outside of their organizations. Unique features for legal professionals include anonymity, which allows lawyers to have ‘off-the- record’ conversations with their colleagues, Foxwordy Teams for organized conversations and exchanges of resources, Clause Collaboration for real-time editing with colleagues, and more. Your network, big or small, gains its power when you and others tap into it. Building a network is one thing, engaging with your network is another. Start first by building the right network in the right way. Meet the people you want to meet. Ensure that you can be found as well. And don’t just “connect.” That’s so last decade. Engage! When you meet someone new, follow up. If you want to connect with someone- tell them why- follow up and set a time to meet or at least speak or Skype. Being a good networker isn’t just about taking, it’s also about giving. Those who understand this thrive. Help others get noticed, share your expertise, and let others know they can rely on you. What you give away will come back to you tenfold. Collaboration equals access. Most new business comes through lawyer-to-lawyer referrals. Putting yourself out there means showcasing what you know so that when that business or job opportunity comes up, you’re the first person your legal colleagues will have in mind. When a colleague posts a question that relates to something you know, take a few minutes to answer it. When your colleague is in need of a referral, take a minute to respond to that request. Too busy, right? Wrong. We’re always “too busy.” Take a few minutes to do this each day. There may be a time when you need someone to help you. Doing this builds relationships and trust. People refer and hire those they like and trust. Collaboration paves the way for this essential level of relationship building. When you put yourself out there, good things happen. It’s simple: lawyers who collaborate get their work done faster. Why reinvent the wheel when you can learn from others and leverage existing tools and resources? Collaboration allows you to avoid the need to “reinvent the wheel.” Instead of spending ten hours researching “what’s market,” benchmarking what’s market with our relevant colleagues can take as little as 30 minutes giving us vetted, practical information. Instead of spending hours drafting language for a document that you need to send out yesterday, ping your colleagues and get that language in minutes. That’s where Foxwordy helps; our technology is built for these use cases. Lawyers are expected to maximize what they can do in the least amount of time and with the least expenditure of their time or outside resources. 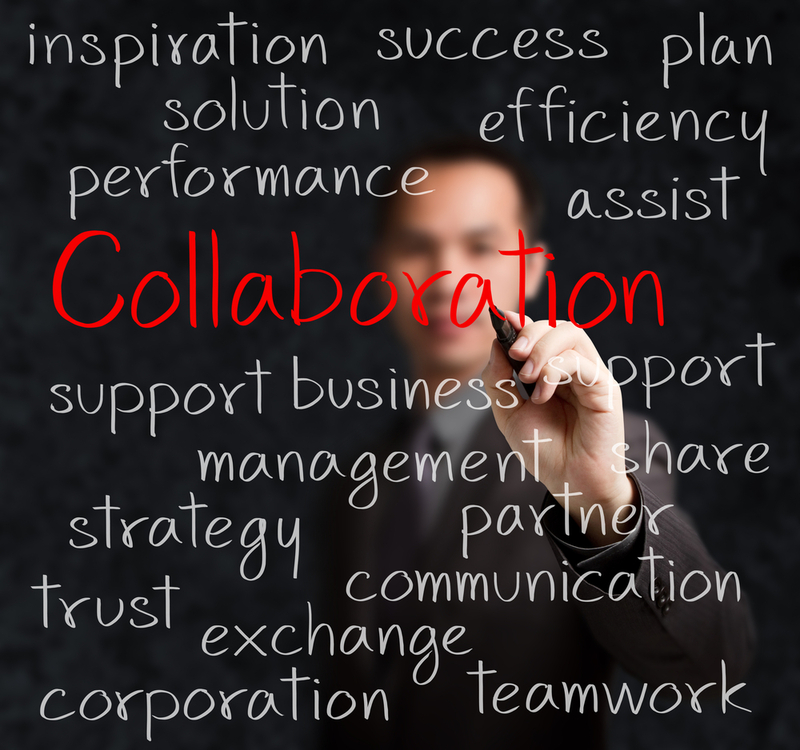 Collaboration allows lawyers, law departments and law firms to rise to this challenge. Collaboration leads to higher quality work. When lawyers talk with each other, exchange ideas, and share perspectives based on their expertise, clients win - big time. The inverse is also true. We’ve seen this play out time and again with our institutional clients that have large legal departments. Those with unhealthy departments where work is stuffed into narrow silos end up with team members who don’t meaningfully engage with each other. This means the organization – the ultimate client – suffers because it’s not benefitting from the collective expertise of the department on certain matters. The reality is, lawyers who cooperate are more innovative, come up with better ways of doing things, save money for clients, and, look good doing it. Effective collaboration allows you to showcase your strengths and influence others. It gives your relevant peer community a sense of what you can do and let’s people know that they can depend on you. They, in turn, are more likely to help you get a job or promotion, send a client referral to you, ask for your expertise, or solicit your opinion. In the course of collaborating with a colleague, trust is built and trust is the foundation of any lasting relationship, whether business or personal. Great collaborators keep their word because at the end of the day, that’s all you really have. When you make a promise to a colleague in any setting, or say you’re going to make an intro, or send a colleague something to help them in their issue, always keep your word. When they do the same for you, that bilateral trust bond is secured and will pay dividends in the long run. In recent years, we have heard a lot about the need for greater transparency in how legal work is produced and how legal services are delivered. Collaboration facilitates greater transparency among colleagues involved in the matter, case, deal or whatever the issue might be. When one is working on a team with colleagues, there is nowhere to hide. There is no place for toxic, secretive, or un-collaborative personalities on a team when collaborating. This keeps everyone on best behavior and honest. Foxwordy’s built-in transparency in our Teams feature is one example of how technology can help facilitate a healthy workplace culture of transparency and collaboration. Be patient. Reaping the results from collaboration takes time. It’s like that old saying about how we reap what we sow. Sow seeds with colleagues via collaboration and reaps the rewards of a better quality network and solid relationships, a good reputation, and opportunities heading back in your direction, along with more time and money in your pocket. The good news is you’re probably already collaborating more than you realize. Any time you’re part of a deal team, litigation team, committee, cross-functional team, or task force, you are collaborating. So embrace it and see what happens. You have only good things to gain.